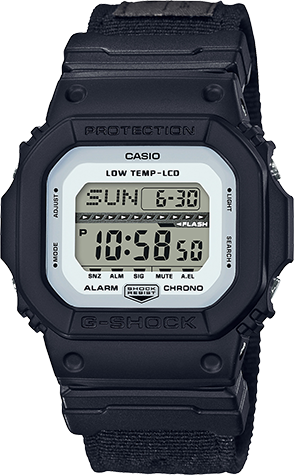 The G-SHOCK winter G-LIDE lineup of sports watches are a favorite choice among the world's top extreme sports athletes. These models are based on the compact GLS5600, which boasts low temperature resistance up to –20°C/–4°F and the ability to stand up to the severe conditions presented on snow-covered mountains or in the back country. 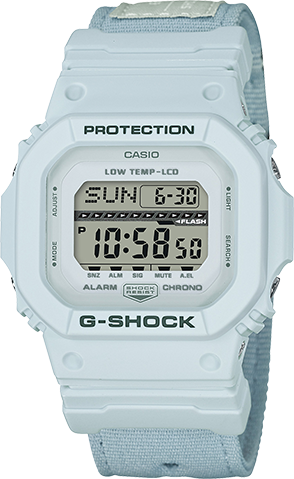 The coloring and cloth band of the 5600 model makes it a masterpiece of tough, uncompromising G-SHOCK design. The band ring is made of strong stainless steel that stands up to use in the hardest environments and resists wear. The band on the 12 o'clock side is decorated with a patch that gives it the appearance of a flight jacket. 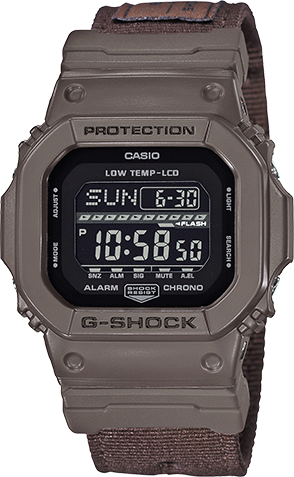 Four different models provide a color choice of black or white, or earth brown or khaki.